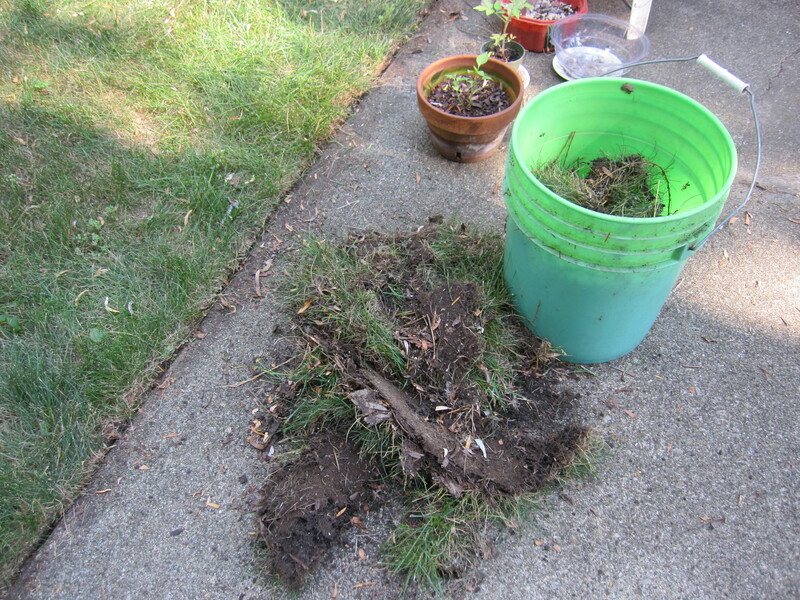 My patio was lost under willow leaves and sticks, pots and potting soil, and a big green bushy bush. I have a vision of me, sitting outside on my patio with my cup of coffee and reading the paper, just like I’m on vacation only I’m not; I’m at home. With my patio under this mess, however, this vision would never actually become a reality. I started off by clearing the table of all the gardening implements I dragged out in the spring, and hosing the layer of soil off. I washed it with some natural soap, and hosed it again. Clean and sparkly! I opened the umbrella and swept out some old wasps’ nests that were only half-way built. Those dang wasps keep coming back when the umbrella is closed, so yesterday I sprayed the umbrella with a little wasp killer. I hope that keeps them away! A neat edge…I am woman, hear me roar! The next day, I swept off all the old leaves and dirt from under the table. There actually was a patio under all that debris! 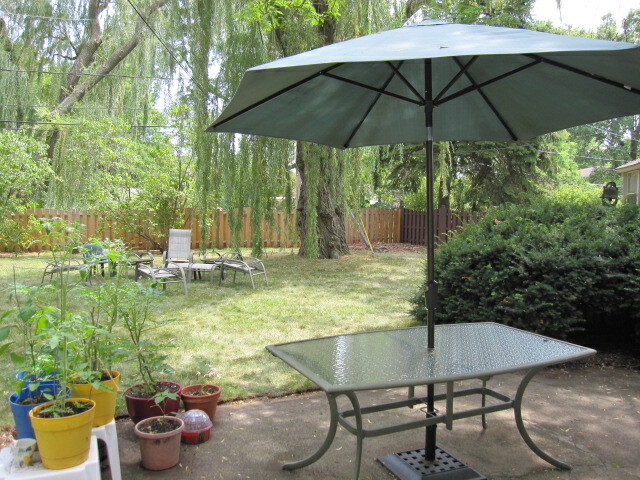 The chairs that belong with the table are grouped under the willow tree from our 4th of July party. We never actually sit at the table very much. My next project is to tackle that huge green bush on the right and trim it down. I’m waiting to borrow my brother-in-law’s electric trimmer–I do not want to tackle it with our hand trimmer. I’m lazy that way. On the left of the patio is our vegetable container garden. I’m hoping we get to the tomatoes before the chipmunks do! My lost patio, found again! I have yet to sit outside with my cup of coffee, however. Too hot. In fact, it has been so hot (over 100 degrees) that we used our patio table for another project. We melted crayons. 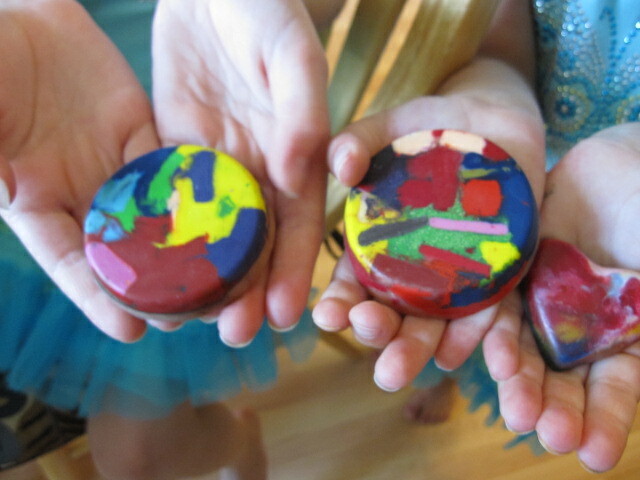 Lily and Emmy’s new crayons! Written as part of Gretchen’s Spin Cycle prompt, “Lost and Found”. What summer project have you been working on? Your patio looks beautiful and I like the activity that youve done with your kids. I hope I can do something like this in my carport in Perth if I have a spare time. You have a pretty nice outdoor patio and what's really great about this is that it's huge. Perfect for kids to play around. I think you should also add some outdoor awnings in Perth to create more shed. Someone's been busy! I haven't been as productive as you. I picked up some new outdoor items from Sunwise Outdoor Living, but I still have to set them up. I know it's been hot in the Chicago area but didn't think it would melt the crayons!_Your patio look inviting….enjoy! Popped in from SITS! 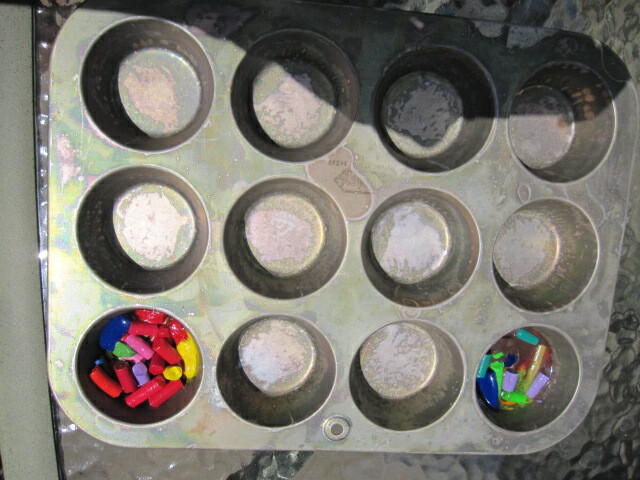 I love those muffin crayons! Do you make housecalls at all? I love the crayon idea. And your patio is lovely. I hope it serves as a soothing haven for you. I’m very jealous of your willow tree. I love those! Unfortunately, I can’t have one because of the location of power lines. Ah, well. Beautiful use of the Lost and Found prompt! I'm afraid I have a few lost areas of our yard that desperately need to be refound! Good job. Your patio looks nice and inviting. Enjoy! My recent post Coffee Friday!!! Want a cute cup? DIY! I feel for you with all that edging. That is a TOUGH job and not even a little bit of fun. Glad you're making it more pleasant for the fam out there. Now we just need a cool off so it's nice to sit out there, right? I admire your energy and determination. Looks like you did a great job on your patie. I have to confess, I'm not very ambitious; if I get this place vacuumed, I feel like I've accomplished a lot! I just stopped by from SITS to say hello. Hope you find time to do the same.